Recorded at Mind and Media, 1989–2001. “Expo 1–6” recorded at Holbaek County Hospital in the autumn of 2000. 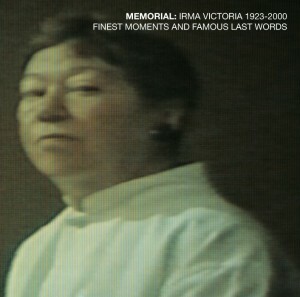 On the one-year anniversary of Danish “diva” Irma Victoria’s death (November 10, 2001) Martin Hall and MNW released the album Memorial – Finest Moments and Famous Last Words. The double-cd is a mix of her best recordings as well as a few at the time unreleased tracks. The titles “Expo 1–6” were recorded at Holbæk County Hospital shortly before the singer’s death at the age of 77. 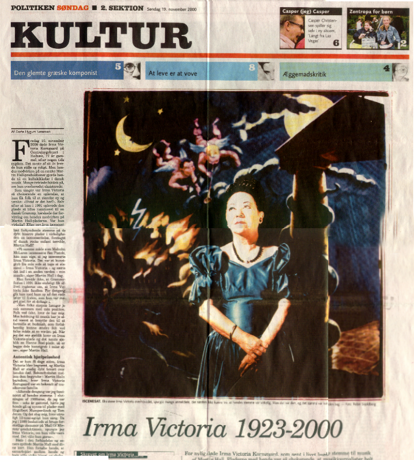 Furthermore the release includes a bonus disc, a Danish National Radio programme commemorating the life and art of Irma Victoria, originally broadcasted on December 9, 2000. The programme was made by Søren E. Jensen and produced by Jytte Nordholt. 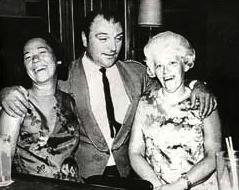 Born on September 2, 1923, Irma Victoria made her debut at the age of 66 with the song “Memorial” on the Martin Hall production The Hall of Mirrors released in September 1989. The track instantly became a cult classic and mystique subsequently rose as to who this new Martin Hall finding was. 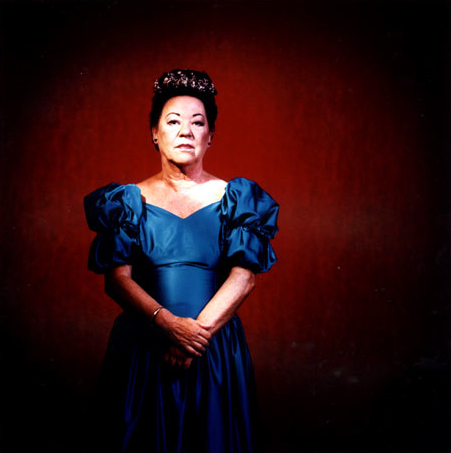 In September 1990 she performed on the ep Palladium and in November 1990 she released her debut album The Rainbow Theatre – an album that quite surprisingly earned her a Danish Grammy nomination in the category “best female singer” in February 1991 (competing with only two other candidates, Danish multi-platinum act Hanne Boel and legendary Savage Rose lead vocalist Annisette). Unfortunately, Irma Victoria didn’t win the award. 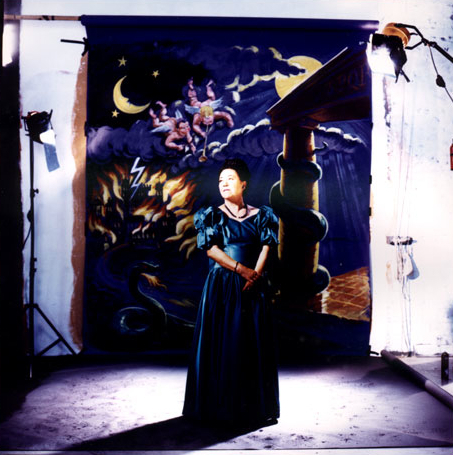 Having received The Medal for Meritorious Service, a distinction handed to her personally by The Queen of Denmark, Margrethe II, for loyal service in the Danish Department of Defence, in the autumn of 1993, Irma Victoria released her second and highly anticipated album Phantasmagoria – The Second Coming in October 1994. The record contains contributions from several prominent musicians on the Danish independent music scene (such as members from the original punk and post-punk bands Sort Sol and The Poets) and the release received massive media coverage … all helped along very nicely by a widespread poster campaign sponsored by Carlsberg. Phantasmagoria received a line of great reviews in both Denmark and abroad and was exported to France, Germany and England. At the time of the release several tracks wound up in heavy rotation on the French radio station Scandal and a few years later the British neofolk group Death in June used the album as lounge music on their 1997 European tour. In the autumn of 1995 Irma Victoria performed on the controversial tribute album to the legendary Danish sixties band Steppeulvene, Hip, where she interpreted the group’s signature song “Itsi Bitsi” (the track was singled out as one of the highlights of the album by the press, although several journalists found her version to be an outright desecration of the original song). In the spring of 1997 she furthermore appeared on the ep Hallmark 1–4 performing the title “Tears and Morphine”, a new version of “Tears in the Rain” from Phantasmagoria. By invitation of the Danish record label Addiction Martin Hall and Irma Victoria discussed the possibility of recording a newly written narrative by Hall shortly before Irma Victoria’s death. Due to the singer’s deteriorating health the idea was never realized, but the titles “Expo 1–6” on the Memorial compilation album are based on some test recordings made towards this end at Holbæk County Hospital. Memorial was released concurrently with the exhibition A Hospital Room at Ystad’s Konstmuseum (a Swedish art gallery), an audio installation made by Martin Hall about Irma Victoria. The exhibition ran from October 20 until November 25 2001. You can read more about the event here. As a special feature on the Memorial album, Sharin Foo – singer and front figure in the world famous Danish indie darling act The Raveonettes – appears as guest singer on the “River of Light” track.